President tweets support of motorcycle boycott. 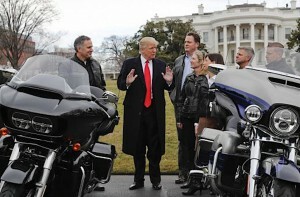 President Donald Trump has once again turn his focus on Harley-Davidson, with support of a boycott of the American motorcycle maker. President Donald Trump is attempting to rally Harley-Davidson owners to boycott the company if it moves any of its production overseas. In a tweet, Trump said that “many” Harley owners were going to boycott the company. The company earned the president’s ire after it announced plans to build some motorcycles at overseas locations to avoid the steel tariffs put in place by the Trump administration as well as the retaliatory taxes enacted by the European Union in responses. The company said it would lose as much as $100 million annually due to the move, which would raise the price of the motorcycle by more than $2,200. It also noted that all bikes sold in the U.S. are made in the U.S.
Other manufacturers have issue similar warnings, including General Motors. However, after Trump met with about 180 bikers who are part of a “Bikers for Trump” fan group at his golf course in Bedminster, New Jersey, he got on to Twitter. 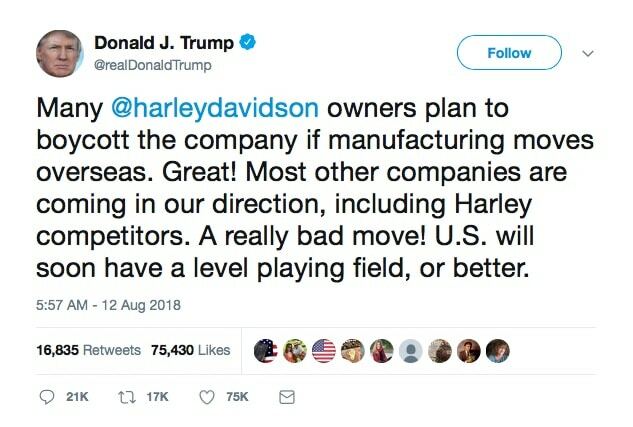 Trump latest Harley-Davidson tweet calls for a boycott. Trump has pushed some trading partners to eliminate tariffs all together, but no deals have been reached. In the meantime, he’s involved in trade wars with China, Japan and the European Union and has made difficult demands during the process of renegotiating the North American Free Trade Agreement. The president has been repeated warned by large companies and entire industries against this strategy but forged ahead anyway, including shelling out $12 billion in subsidies to American farmers to offset losses related to his strategy. President Trump has gone from being supportive of Harley-Davidson to threatening the company with a "huge" tax. 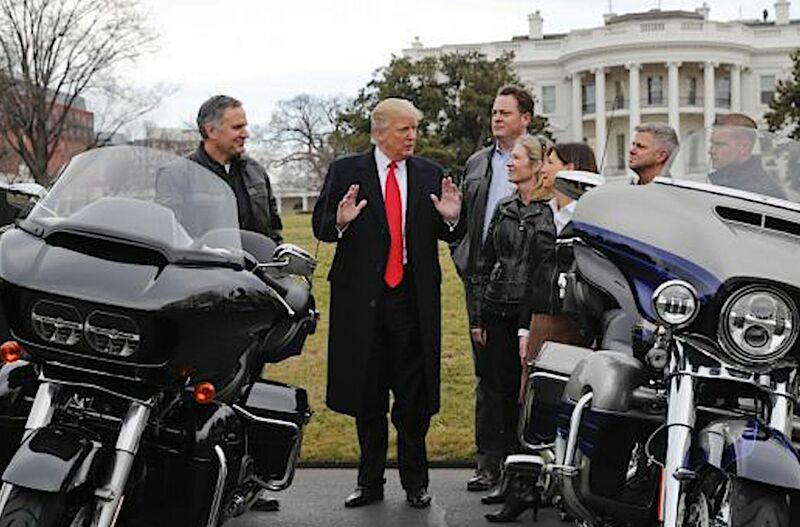 In the meantime, Trump has gone several rounds with Harley-Davidson, fracturing a relationship that had once been very friendly, including the president calling the company “an American icon” after Harley executives visited the White House earlier this year. Governor Scott Walker, the Republican governor of Harley’s home state of Wisconsin, offered some support to Trump, in a statement: “I want Harley Davidson to prosper here in the state of Wisconsin. 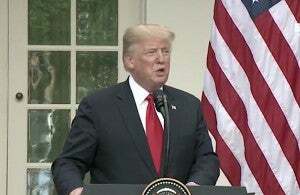 And one of the best ways for that to happen is to do what the president has called for and that is to get to no tariffs.” Harley-Davidson officials offered no comment. This entry was posted on Monday, August 13th, 2018 at and is filed under Asia Pacific, Business, China, Europe, Executives, Markets, Personalities, Politicians, Sales, Trade, U.S./North America. You can follow any responses to this entry through the RSS 2.0 feed. Both comments and pings are currently closed.